For people in Northern Tablelands and parts of Mid North Coast, Hunter and North West Slopes and Plains Forecast Districts. Issued at 3:07 pm Tuesday, 9 April 2019. Weather Situation: A cold front is crossing New South Wales, generating fast-moving thunderstorms in the northeast ahead of it. Severe thunderstorms are likely to produce damaging winds in the warning area over the next several hours. 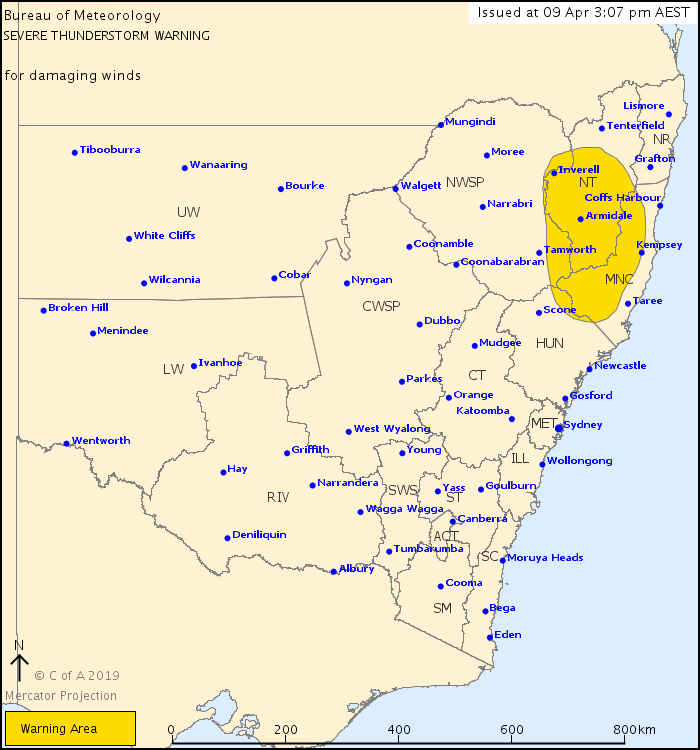 Locations which may be affected include Armidale, Glen Innes, Inverell, Walcha and Bendemeer. 90 km/h wind gust was observed at Armidale Airport at 3:05pm.